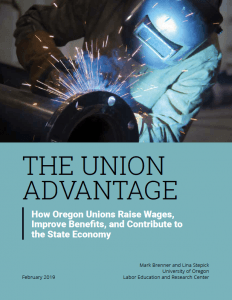 Their findings are consistent with previous national and state-level research, revealing that unions in Oregon raise wages, improve health and pension benefits, reduce overall income inequality, and significantly decrease racial and gender inequalities. Oregon unions also make it much less likely that workers will need to rely on public benefits such as food stamps or welfare. Are 33.8% less likely to belong to a low-income family. Being covered by a union contract adds an average of $4,701 per year to each worker’s annual income. The authors estimate that unions increased the overall income of working Oregonians by a total of almost $1.4 billion in 2017.